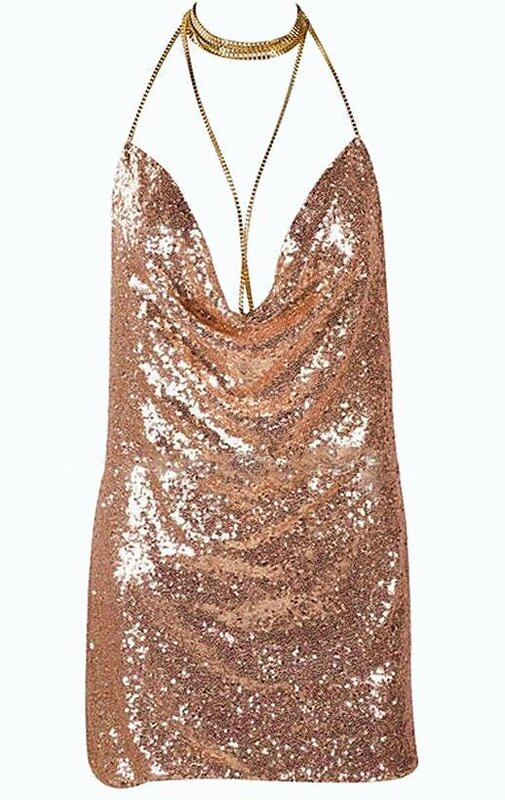 These reproduction disco dresses are covered in tiny pale copper real sewn together sequins. The dresses are a micro mini dress length and square shaped before putting on. One should probably be 5'3" or short to wear it as a dress. They have a deep plunge in the front and the back. The lined dress has a piece that goes across in the middle back to help hold the dress in place. The dress is covered with smooth sequins and it is hand washable. Dry flat or hang. One of these looks like a size 10 and the other a size 12 with a possibly larger chest. The chest is approximately 36"C - a 40B on the size 10. It's flexible. The hip is approximately a 36 - 42 fit on the size 10. The fabric will stretch. The 12 is larger. These dresses may be large enough for a drag queen. You may order via PAYPAL by sending payment and stating what item payment is for to the above email address.